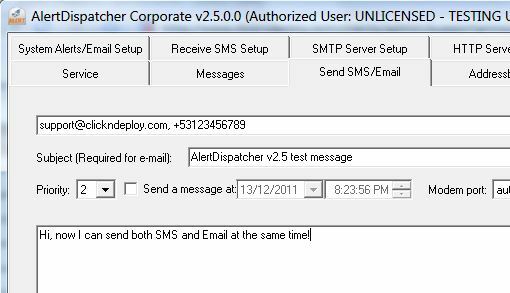 - Added Email Broadcast and ModemMails (via GPRS) support to SMS messaging system - you can broadcast to both SMS/Email defined in the Addressbook. - Outgoing message filter - Block messages by content keyword and recipients (Wildcard matching supported). - "Sleep period" for low priority messages. 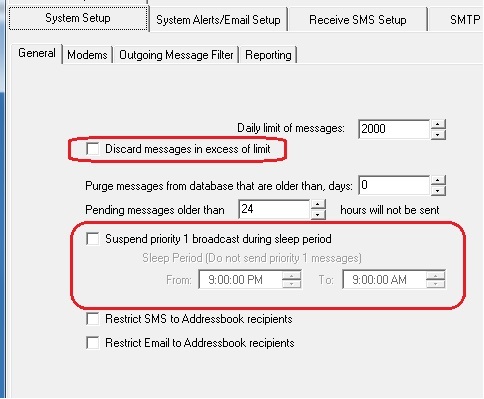 - Option to discard new messages if the system has exceeded the daily message limit. - Fixed Unicode decoding/encoding bug for concatenated/long SMS. - Multi user login and access right control. - Remote Client support (for Corporate license). - Auto-generate Daily/Monthly/Yearly message sent/received reports. - Sound PC buzzer and display warning messagebox on modem or send alert failure. - Option to load CSV into Addressbook without replacing existing recipients. - Recipients can SMS "UNSUB" to unsubscribe themselves from Addressbook - to comply with government regulations. - Option to restrict SMS/Email (send/receive) to Addressbook recipients. - Improve Addressbook handling capability to 10,000 recipients per group. - Execute DOS command/application on received SMS and return result by SMS. - Display modem status via http://alertdispatch-ip-address/sendstatus and server status via http://alertdispatch-ip-address/checkserver. - Command line interface to send alerts (Remote support). - Network DLL library to send/receive SMS/Email. C#, VB.NET and Java examples provided. - Web based send alert (Email/SMS) form. 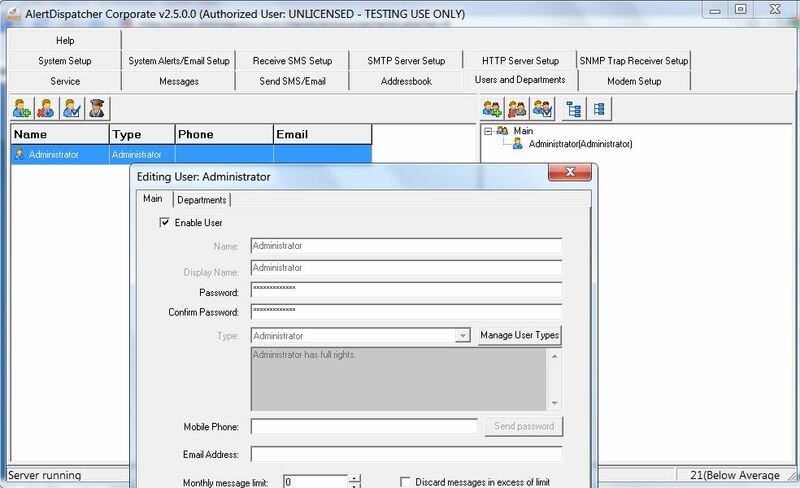 - SNMP Trap Receiver - Send Alert (SMS/Email) from SNMP Traps. Click here to download upgrade. 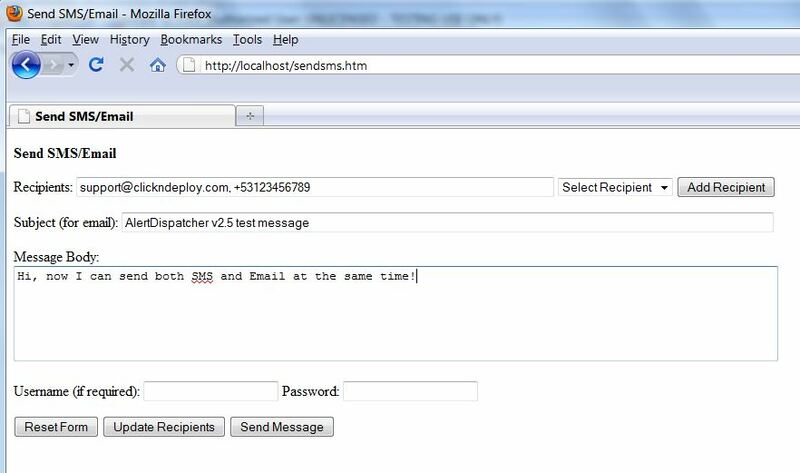 Single interface to send both SMS and Email.